Riding Monster Waves in Oregon | Mediterra - Swim & Run Better Than Ever! You cannot imagine the power rising up beneath you on a wave like this. Would TI help me stay calm if I had to swim through this???? 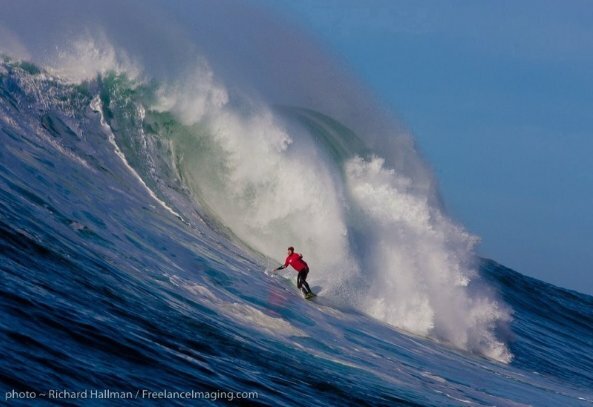 Oregon Big Wave Surfing on my home turf! There was an article in the NY Times about the monstrous wave surfing contest there. Check out these pics on the contest’s site! Until you sit on your foam board and feel the power of a mere 2m wave pick you up from below, you cannot imagine the awe and terror of feeling a 16m wave rise up underneath and hurtle you at murderous velocity! My imagination terrifies me. I would gladly watch this from shore. However, back in the day I was a very SMALL-WAVE rider, and not a very good one at that. Now that I am working on my ability to swim bare in sub-20 C water in the balmy Mediterranean, I recalled those days sitting on my longboard fully suited, in 12 C water (waiting for wee-little swells!). A hoody, boots, and gloves were still barely enough to keep you from going numb in 30 minutes if you didn’t start paddling. Oh, that chilly Oregon water. With the deadly cold, treacherous currents and big hungry critters swimming about below open-water swimming on the Oregon Coast would be classified as an ultra-extreme sport if they did not outlaw it. These pics make me miss my homeland and especially the unique beauty and merciless power of the Oregon winter waves, but I would NOT want to be out there dodging those monsters- I would pee my wetsuit before being crushed and pummeled to the icy depths… you can’t duck under those and avoid their cluches so easily- hence, the jetski tow-ins. © 2010, Mediterra International, LLC. All rights reserved. Unauthorized use and/or duplication of this material without express and written permission from this site’s author and/or owner is strictly prohibited. Excerpts and links may be used, provided that full and clear credit is given to Mediterra International, LLC and Mediterraswim.com with appropriate and specific direction to the original content.